Michael Ableman, Michael Stadtlaender, Heidi Noble, Brent Petkau aka The Oysterman, Sinclair Philip: These are just a few of the people and personalities across North America who are building sustainable food systems and sustainable food is what Tableland (a film by Craig Noble featuring these people) is all about. 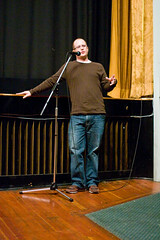 I was lucky enough to see the screening on Sunday at The Ridge and was able to record the dialogue and Q&A with Chef Jeff Van Geest (9:16 5MB MP3 file for your iPod or MP3 player) of Aurora Bistro (one of the first restaurants in Vancouver that uses primarily sustainable food) and with Craig Noble (20:39 11MB MP3 file). The film is a gentle, convincing case for sustainable food and leaves you hungry and wanting more. Hungry for more sustainable food, more food with great taste and more knowledge about how we can all move to this in the future because of course a move to a world where everyone eats sustainably will take many years just as it has taken decades to invent and globalize industrial food production. Highly recommended! A perfect Christmas gift for everyone interested in food. The DVDs will be on sale for $20 at Edible BC at Granville Island and other locations.